Problems with Pigeon Droppings? We Have Your Solution! 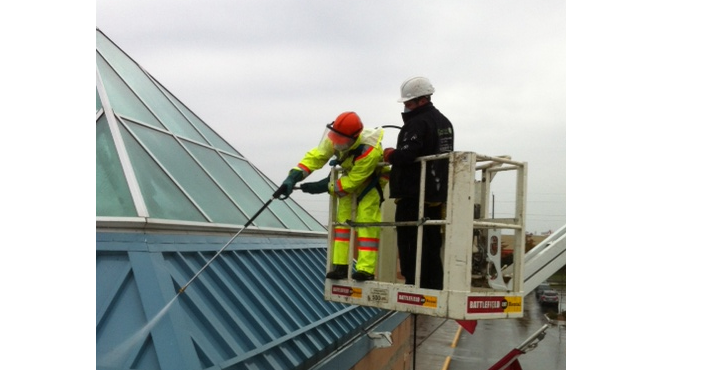 Bird dropping decontamination treatment done at a mall in Cobourg. If you are a business property owner, you may be very familiar with pigeons. They are a common problem for many as they deface the sides and fronts of buildings with their droppings. This can be damaging to a businesses reputation and present health risks to the people visiting and working there. One of our clients was at the Northumberland Mall in Cobourg, where we had our wildlife technicians complete bird dropping removal and decontamination. After, they installed bird netting and bird spikes which act as a physical barrier to keep the birds away. Pigeons are the most common pest bird that are dealt with year-round. They are found roosting and nesting around cities, parks, residential and commercial properties. They can be very troublesome as they perch on buildings overhead and deface the sides and windows of buildings. Pigeon feces are extremely foul and have corrosive properties that can destroy many surfaces and materials. The contamination can even be spread into buildings through HVAC systems and being tracked inside the property. 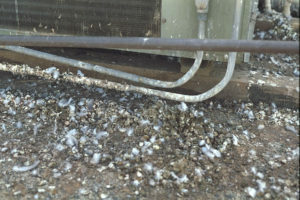 Materials left by pigeons, such as debris, droppings and feathers an also block HVAC systems, drains, vents, gutters and eavestroughs. Nests constructed by the birds, if close to electrical boxes and wiring, are a fire hazard. Lastly, they can also carry with them harmful diseases such as parasites and bacteria. Damages caused to AC wires, which are corroded due to pigeon droppings. 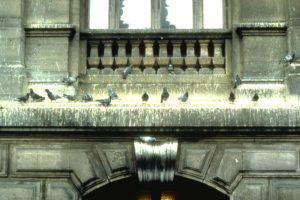 Contamination caused by pigeon droppings on the ledge of a building. If you have a problem with pigeons or any other pest bird, it is best to let the professionals deal with it. Our wildlife technicians will visit your residential or commercial property and assess the damage and where the pigeons are nesting. They will implement the appropriate treatment, which is usually the installation of deterrents. These are different products that we install to create a barrier so that the birds do not have access to the area where they like to nest. For example, the use of netting, bird slides, bird spikes and bird wires are all common deterrents that we use. We will also decontaminate the area so that your property is looking clean and new again. If you have a pigeon problem, please call us today at 613-389-3999, and we would be happy to help you be pigeon free.